Please encourage your students to come– especially if you are from other schools. Our goal is to share this platform with other schools so we can invite students from EVERYWHERE to join us in future years. The ultimate goal is to help other schools host an Outlet of their own. 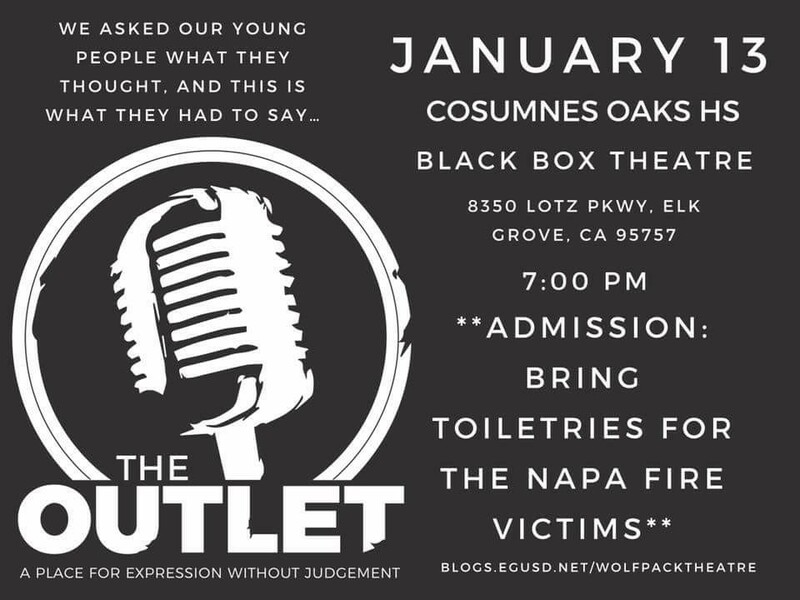 What is the Outlet? A few years ago, our school district experienced six suicides. And we all agree that even one is too much. As adults, we like to THINK we know what is going on in the minds of our youth, but the truth is we don’t. The Outlet is an opportunity for our young people to share with us what is truly going on in their minds without fear of judgement. Many of the writers have opted to be anonymous and their works are being read by actors. Others are taking the stage for the first time. We hope that you will help us spread the word. Teachers: Please send me your student leaders. I would be more than happy to link with them, and bring them into the process in any way that they feel comfortable. Note: While we encourage young people (middle school students) to come, the content of some of the works is more mature. While tastefully done, I would accompany your child and be prepared to discuss these topics (harassment, women’s issues, intolerance, death).